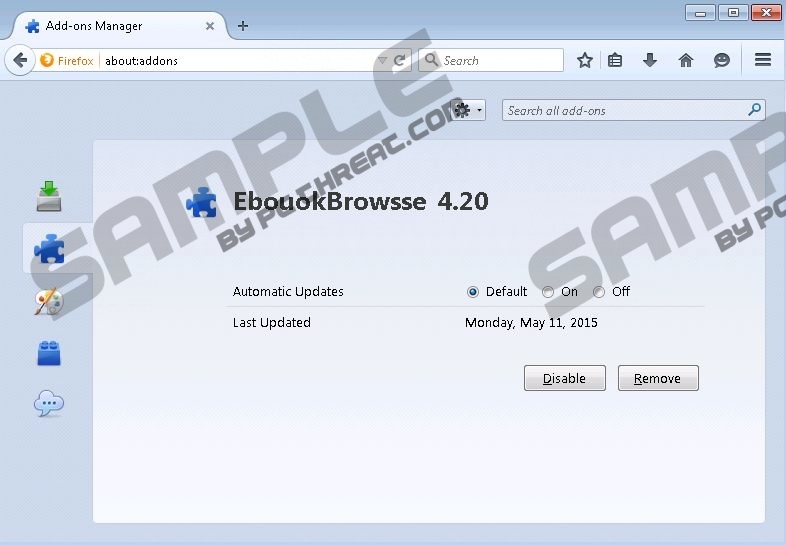 EbookBrowse is another adware program that is based on the JustPlugIt engine. As it belongs to the MultiPlug family, it is not surprising that it acts exactly like other previously published programs, e.g., LuckyCoupon, SaveNShop, and SharkManCoupon. If you have ever encountered any of them, you will definitely know that EbookBrowse is just going to show commercial advertisements on your screen and it is not going to do anything beneficial for you. We do not think that it is worth keeping suspicious programs installed, so we recommend that you remove EbookBrowse as soon as possible. Read through this article if you want to find out how to do that. This advertising-supported application is distributed mostly via the InstallRex installers. In addition, it is sometimes distributed via the Amonetize or Vittalia installers as well. Actually, many computer users do not even know how and when EbookBrowse entered their systems, but that is not the most important information, because the most important thing is to remove EbookBrowse as soon as possible. Of course, we understand that this program might seem harmless at first sight; however, the truth is that it might even cause you security related problems. Actually, the program itself is not very harmful, but it generates advertisements that might expose you to threats very quickly. If you do not want this to happen, make sure that you stop these ads from appearing as soon as possible. EbookBrowse not only shows advertisements, but it might also perform other activities behind your back. For instance, our specialists have discovered that it might connect to the Internet without your permission, and it might even record details associated with your activities on the web. If you do not like how EbookBrowse acts, you can remove it from your system and stop all its activities. In order to prevent other JustPlugIt-based adware from entering your system, you should install a security tool. You can remove EbookBrowse via Control Panel easily and quickly. In fact, we suggest that you do that as soon as possible because you might install a bunch of malicious applications on your system if you keep EbookBrowse installed. If you do not know how to delete malicious applications, you can get rid of EbookBrowse automatically. In order to do that, you have to install a trustworthy security tool on the system and perform a system scan. We believe that the SpyHunter antimalware suite is the best choice because it is a 100% reliable tool. Of course, you can use another tool as well. Quick & tested solution for EbookBrowse removal.